The 2nd annual Loch Ness Classic Car Tour. Mike and Susan Holt from Stirling in their, 1922, Vauxhall 23-60. Classic car owners have raised £4,000 for charity – by touring Loch Ness in their head-turning motors. 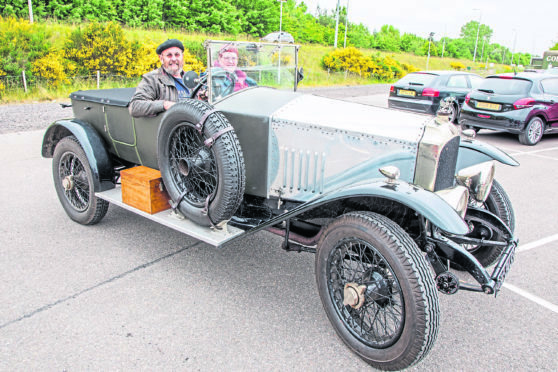 Inverness Loch Ness Classic Car Tour took place on Saturday, with three Italian sports cars – an Alfa-Romeo 4C, a Fiat 124 Abarth Spider and a Ferrari 360 Modena – and several modern day models in the 20-strong cavaclade. However it was a 1922 four-litre Vauxhall, belonging to Mike Holt and Susan Torrance, that stole the show. Event co-organiser Ormond Smith said that despite the drop in entries, the day had been a roaring success. He said: “It went very well indeed. The car entries were lower than we hoped for but what we lacked in numbers we got in quality. “We had 20 cars ranging from a 1922 Vauxhall that drove up all the way from the Central Belt. It’s a fair distance in an old car but it toddled up the road quite the thing. They said the enjoyed the run up. “We also had a 1948 Rover 75 and a 1951 Jaguar xK120 which was superb. It’s in immaculate condition and it sounded great as well. We are pleased with how the whole day went. Each car began the tour at Fairways Gold Club, before heading north along single track roads in Nairnshire and across the Muckle Burn at Fornighty Ford near Lethen. Loch Ness prior to heading back to the start. Organised by Inverness Loch Ness Rotary Club, this year’s run raised cash for Children’s 1st Highland Branch.